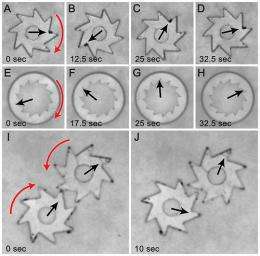 Diagram tracking the movement of gears turned by the bacteria. (PhysOrg.com) -- Scientists at the U.S. Department of Energy's Argonne National Laboratory and Northwestern University, Evanston, have discovered that common bacteria can turn microgears when suspended in a solution, providing insights for design of bio-inspired dynamically adaptive materials for energy. "The gears are a million times more massive than the bacteria," said physicist and principal investigator Igor Aronson. "The ability to harness and control the power of bacterial motions is an important requirement for further development of hybrid biomechanical systems driven by microorganisms." The microgears with slanted spokes, produced in collaboration with Northwestern University, are placed in the solution along with common aerobic bacteria, Bacillus subtilis. Andrey Sokolov of Princeton University and Igor Aronson from Argonne, along with Bartosz A. Grzybowski and Mario M. Apodaca from Northwestern University, discovered that the bacteria appear to swim around the solution randomly, but occasionally the organisms will collide with the spokes of the gear and begin turning it in a definite direction. A few hundred bacteria are working together in order to turn the gear. When multiple gears are placed in the solution with the spokes connected like in a clock, the bacteria will begin turning both gears in opposite directions and it will cause the gears to rotate in synchrony for a long time. "There exists a wide gap between man-made hard materials and living tissues; biological materials, unlike steel or plastics, are "alive." Biomaterials, such as live skin or tissue, consume energy of the nutrients to self-repair and adapt to their environment," Aronson said. "Our discovery demonstrates how microscopic swimming agents, such as bacteria or man-made nanorobots, in combination with hard materials can constitute a 'smart material' which can dynamically alter its microstructures, repair damage, or power microdevices." The speed at which the gears turn can also be controlled through the manipulation of oxygen in the suspended liquid. The bacteria need oxygen in order to swim and by decreasing the amount of oxygen available, they will begin to slow down. If you eliminate the oxygen completely, the bacteria go into a type of "sleep" and stop completely. Once the oxygen is reintroduced into the system, the bacteria "wake up" and begin swimming once again. A paper on this subject is published in Proceedings of the National Academy of Sciences.